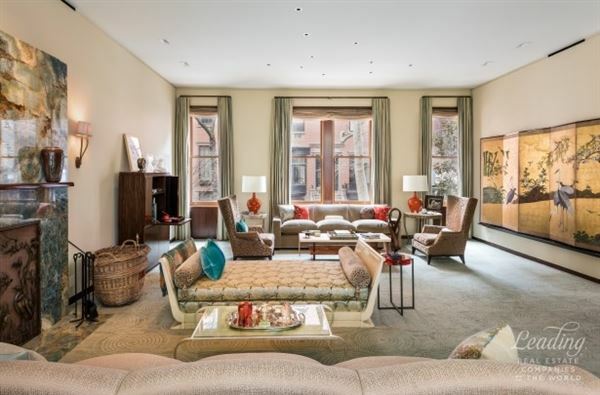 11-13 West 10th Street is a magnificent 55-foot wide renovated single-family mansion, wonderfully located just off Fifth Avenue on the "Gold Coast" of Greenwich Village. This exceptional residence affords approximately 16,560 square feet indoors, with soaring ceilings reaching 21 feet high, a commercial-grade elevator which swiftly serves all levels from the cellar to the top floor, and a Crestron smart home system that controls all aspects of the home on a room by room basis. 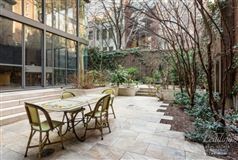 The home also boasts an additional approximately 5,690 square feet of amazing outdoor space throughout the expansive and well-manicured garden, terrace and sunny roof deck. There are townhouse gardens surrounding the property on all sides and landmarked townhouses across the street, allowing for unusually open light and air. 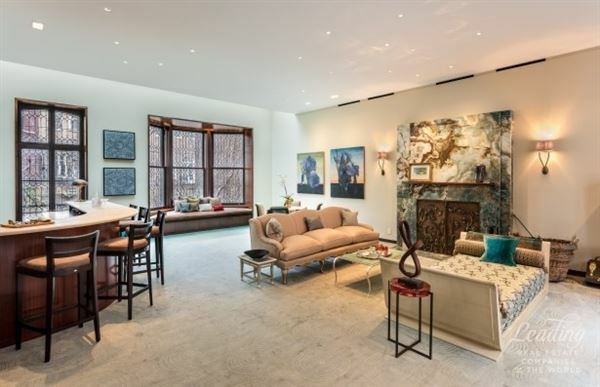 With stunning light and proportions throughout the magnificent living and entertaining spaces, this grand mansion is a rare opportunity to own a truly unmatched residence on one of the absolute best blocks in Greenwich Village. 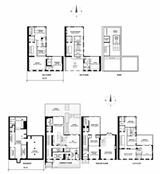 LAYOUT Basement Accessible via stairs or elevator, the basement level affords abundant storage, and features the home's mechanicals and AV equipment. Garden Floor Accessed by a private entrance under the stoop, the Garden Floor features an eat-in chef's kitchen with adjacent breakfast room and a spacious den, which overlook the beautifully landscaped garden through floor-to-ceiling windows. The delightful garden can be accessed by both the breakfast room and den, ideal for outdoor dining and entertaining. 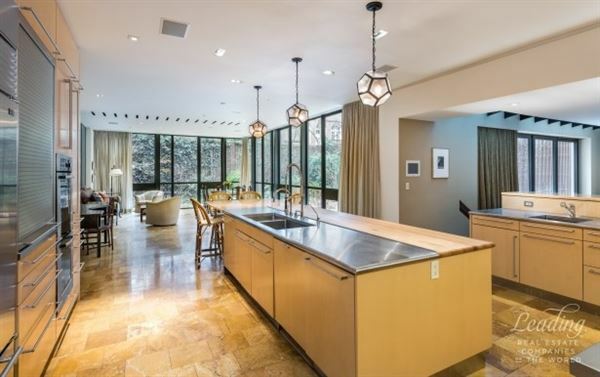 The grand chef's kitchen is replete with top-of-the-line stainless steel appliances, including two side-by-side Sub-Zero refrigerators, a Viking stove, dual Miele dishwashers, and an enormous onyx center island with a large sink and prep area. 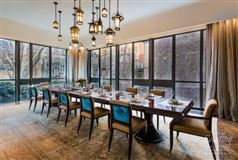 A walk-in temperature-controlled wine cellar with a 2,500-bottle capacity is adjacent to the lovely breakfast room. The comfortable den receives additional light through plated glass flooring on the level above. The Garden Floor also affords custom coat closets, a full laundry room, formal guest powder room, and staff's quarters. The staff's quarters, with 5 large windows out to the front garden, is complete with a sizable bedroom and en-suite bath, living room, and access to a separate service entrance. Parlor Floor Ascend the regal stoop and through the elegant double-doors, to the stunning Parlor Floor, with soaring ceilings, and grand rooms for unmatched living and entertaining. 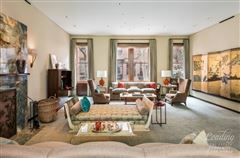 The reception lounge and spectacular living room receive excellent South light and charming views of West 10th Street through grand windows. 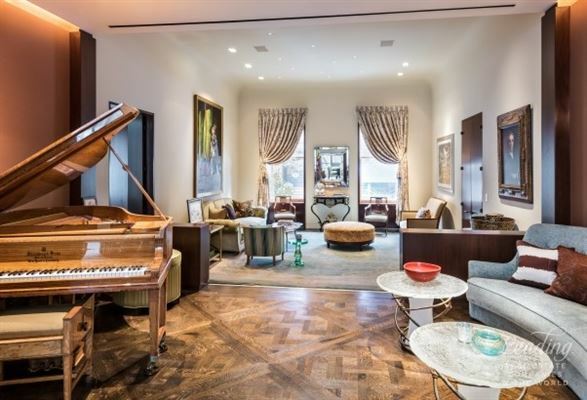 Ideal for impressive entertaining, the expansive living room affords South and North exposures, an elegant onyx wood-burning fireplace, garden views through gorgeous original leaded glass windows with intricate wooden trim, and a fully-equipped wet bar with a refrigerator and a dishwasher. 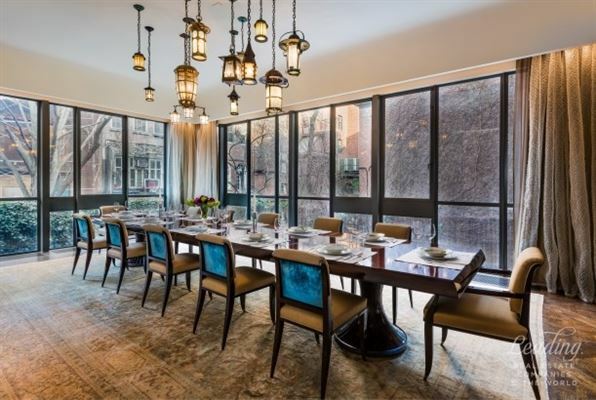 The stunning formal dining room receives beautiful garden views through floor-to-ceiling windows, and is appointed with a large butler's kitchen, outfitted with two stainless steel dishwashers and a wine refrigerator. The large commercial elevator has two doors and the rear door opens directly into the separate butler's kitchen, serving as a functional dumb-waiter during formal events. 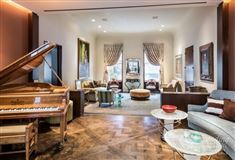 A beautiful music room, discreet powder room, and large coat closet complete this fabulous level. 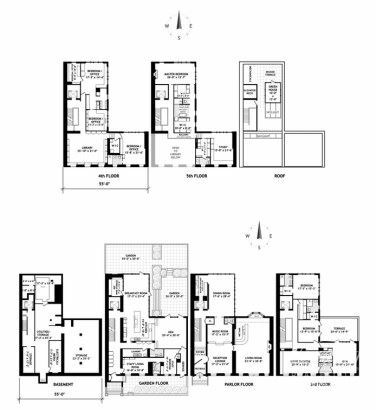 Third Floor Complete with an impressive movie theatre, home gym, two bedroom suites, and a sunny terrace, the Third Floor provides an enhanced modern living experience. The intelligently designed surround-sound movie theatre affords ample space for private or guest screenings. The movie theatre is served by a powder room and kitchenette replete with a dishwasher and refrigerator. The spacious gym has direct access to the bright terrace on this level, which provides a tranquil retreat. Both gracious bedrooms on this floor are appointed with en-suite baths and abundant walk-in closets. The North bedroom has a corner exposure overlooking the garden below, and the second bedroom has access to the serene terrace. Fourth Floor The Fourth Floor features a magnificent library with custom-crafted inlaid bookshelves and dramatic ceilings reaching approximately 21 feet. Brilliant South light is received through large windows and an above skylight. Adjacent to the library is a well-appointed bedroom suite, with a walk-in closet and en-suite bath. There are three additional bedrooms on this level, which afford the flexibility for use as home offices or private studios. Fifth Floor The Fifth Floor consists of a regal full-floor master suite, complete with a five-fixture master bath, three sizable walk-in closets, a comfortable study, powder room and two skylights. The stately rear-facing master bedroom affords a corner exposure, and is graced with a handsome fireplace. The luxurious en-suite master bath is lined in marble, and features a large shower, freestanding soaking tub and dual sinks. An elegant balcony with a skylight above overlooks the breathtaking double-height library below. Roof Complete with an enclosed greenhouse and decked terrace, the home's roof provides a serene urban sanctuary. The sunny open roof deck affords lovely views in all directions and is perfect for additional gardening or relaxation. HISTORY Built in 1847 in Greek Revival style, the westernmost section of 11-13 West 10th Street was erected for Richard H. Winslow, a Wall Street financier, renowned for his role as the originator of the railroad bond system. The eastern half of the property remained vacant until 1888, when noted architect Ernest Flagg added an extension to the property. This portion of the home reached completion in 1919 when it was raised to align with the western segment, and joined with a single cornice. From 1919 to 1994, 11-13 West 10th Street was home to the Ladies Christian Union, and operated as a residence hall for young businesswomen. The property became known as the "Milbank House," in recognition of Jeremiah Milbank, an investment banker, manufacturer and railroad investor, who significantly enlarged the home and donated it to the Ladies Christian Union in memory of his mother and wife, both of whom had served as presidents of the charity. The New York University Law School purchased 11-13 West 10th Street from the Ladies Christian Union in 1994. It was used to house the Global Law School Program, which functioned as a base for visiting professors to lecture on campus. The home was later purchased by private owners, who created the magnificent single-family residence present today.